There is extensive design effort and complexity associated with creating an industrial-grade MPU-based system running a Linux operating system, and even experienced developers spend a lot of time on PCB layout to guarantee signal integrity for the high-speed interfaces to DDR memory and Ethernet PHY while complying with EMC standards. Following on from the successful release of the SAMA5D227 SIP in 2017 Microchip has taken it one step further and released the SAMA5D2 system-on-module (SOM) . It simplifies design by integrating the power management, non-volatile boot memory, Ethernet PHY, and high-speed DDR2 memory on a small, single-sided PCB. 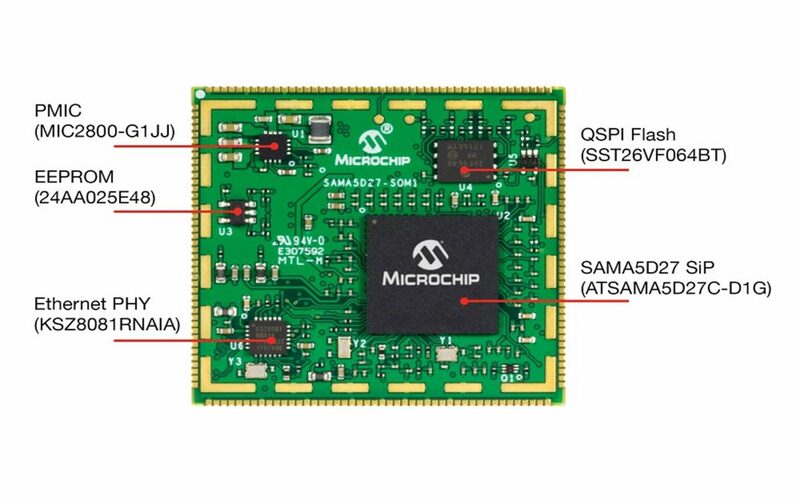 Microchip’s SAMA5D2 SOM is a single-sided PCB with 169 components including the Arm Cortex-A5–based SAMA5D2 SiP that integrates DDR2 memory in a single package, simplifying designs by removing high-speed memory interface constraints from a PCB. All of Microchip’s Linux development codes for the SAMA5D2 SiP and SOM are mainlined in the Linux communities, so customers can connect external devices with minimal software development. The SOM1-EK1 development board provides an evaluation platform for both the SOM and the SiP.